This is not an imaginary phenomena. It is a proven fact and ground reality. Without ever doing your own research, if you believe after watching some youtube videos and study articles that incorruptible dead bodies in religions like Christianity, Buddhism, etc are truly fresh and flexible then beware that you have been totally trapped into manually modified corrupt dead bodies which somewhat look like real due to human intervention. 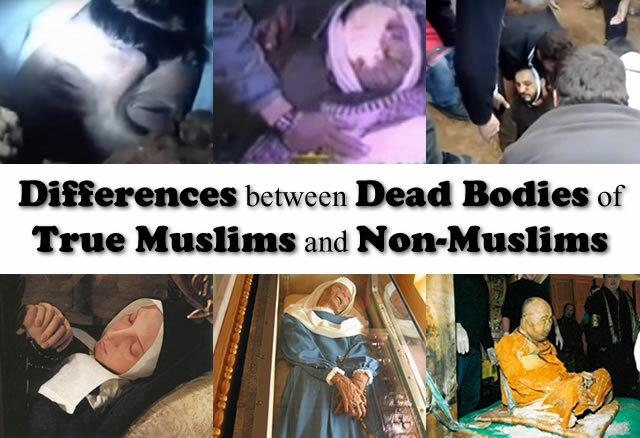 Look at major differences after death by nature on dead bodies of true Muslims and all Non-Muslims. Human actions were used to show them like fresh Nature preserved them in fresh condition due to order of Allah. We have historical evidences, real videos, verification methods and complete research available on this (rightfulreligion.com) website. Nature truly proved that beliefs and lifestyle of only religion Islam are 100% correct while all other religions, beliefs and lifestyles are 100% wrong and rejected near one true God Allah. Beside it, I have notified about this to many Non-Muslims newspapers, journalists, media channels, etc but they do not publish about it and hide from Non-Muslims. Further, I also contacted National Geographic, Discovery, etc but their researchers and team ignored our invitation. I'm sure that it is because they don't want to reveal about fresh dead bodies of true Muslims openly to Non-Muslims public. So, if you are a non-Muslim then I sincerely request you to accept this neutral proof by nature and revert back to Islam because this is an irrefutable reality that none of any non-Muslim of the world can ever prove wrong. This is my open challenge forever to every Non-Muslim. If you are doubtful then research yourself otherwise prove our research wrong. 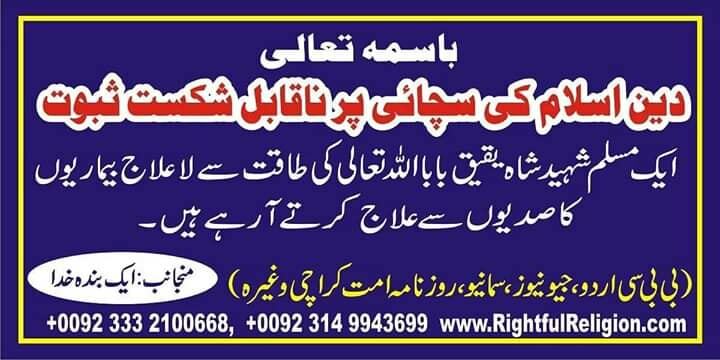 I will not only leave religion Islam but also award USD $10,000 to any one from five billion Non-Muslims and Atheists who can prove it wrong.